Produced with 15-25% recycled material, High Density Merchandise bags are strong and durable, and can hold anything from t-shirts, coffee mugs, books and more! Use this merchandise bag in your grocery and home goods stores or other retail locations. At American Retail Supply, we offer High Density Merchandise Plastic Bags in 7 different sizes and 6 colors. Low Density Plastic Merchandise Bags not only have a classy, gloss feel, but are also strong and durable. Perfect for your gift shop, book store, gallery studio and more! 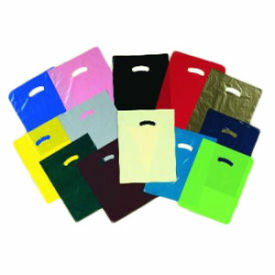 Our Low Density Plastic Merchandise bags are available in 7 sizes and 10+ colors. All Low Density Plastic Merchandise Bags are made in the U.S.A.
Frosted Merchandise Bags are one of the hottest packaging ideas for use in your retail store. These bags are madeof 2.50 mil thick HI Density plastic which gives them their frosted color and extra strength. Frosted Merchandise bags help market your products because the bags are see through. Sold by case with 500 or 1000 bags per case. For customizing options on ALL Plastic Merchandise Bags or to speak to a Product Expert,please contact American Retail Supply at 1-800-426-5708.